FOLLOWERS REGISTRATION TEMPORARILY CLOSED - PLEASE EMAIL US TO BE PUT ON THE WAIT LIST. When: Sundays, March 3d - March 24th, 3:00pm - 4:30pm. Roles will be balanced. Register HERE. LEADERS REGISTRATION ONLY AT THIS TIME. This series is about understanding and executing the architecture or “building blocks” of tango through steps, pivots and the underlying structure of the grapevine. You cannot navigate a crowded dance floor without knowing how to improvise and change course in any moment. This series will free you from your sequences and teach you how to invent your own combinations by assembling the building blocks of tango in endless creative ways. You will learn how to work with the asymmetrical nature of the dance floor and the tango embrace. You will come away from it more creative, empowered, and much clearer in your lead. You will learn how this dance really works. For the following role, especially in the early years, there is a lot of mystic around what’s happening and we tend to enter a passive state. In this series you will be empowered with a holistic understanding of the actual fabric of this dance, and the technique and connection required to make your execution and expression of the unfolding choreography more accurate and artistic. Completion of the entire Tango Mercurio Tango Essentials curriculum (at least once) is preferred or a minimum of 1 year of social dancing experience. When: Thursdays, January 3rd - February 7th, 7:30pm - 9:00pm. Tuition: $100 (non-refundable and non transferable). Please note that you cannot use your Tango Mercurio class package for this or any of our Special Classes. Please write to aja@tangomercurio.org to be added to the waitlist. Gabriel El Huracán from Montreal and Aja Fenn will be teaching a 4 week series for Advanced tango dancers. This series will incorporate skills and technique required to combine elements and create advanced, exquisite tango sequences. it is recommended that you arrive 10 minutes before the start time of each class. During this series you will be working mostly with the same partner with only occasional partner rotation to keep us all honest in our technique. Ramu Pyreddy and Simone Pinheiro, two of DC's most influential teachers, are offering a special intermediate level tango series this Summer Session. Unlike our usual format, this series will be 5 weeks in length with 2 hour classes. Enhance and deepen our understanding of the basic (normal/cross): the structure, timing and history. Delve deep into the world of alterations (aka change of directions) - most essential for navigation. Taste the many flavors (timing, geometry, feeling) of ocho-cortado and learn clockwise turns. Explore the dark side of the embrace and counter clockwise turns. And have fun learning milonga-traspie in the last class! Each class will be 2 hours in length. Come prepared to be challenged and to work hard. July 12th - August 9th 2018. Roles will be balanced. FOLLOWER SPOTS ARE NOW FULL. Ramu took his first tango lesson on April 27th, 2000 in Buenos Aires and was hooked instantly. He still has the same excitement for the dance and his love for the music and the dance continues to grow. To share that passion with his friends and colleagues, he started Michigan Argentine Tango Club at the University of Michigan in Ann Arbor and was actively involved in growing it into a community that is now well known for its excellent social dancing skills. Ramu has since danced, DJd and taught all over the US and Canada. His teaching and dancing are characterized by a keen musical interpretation, infectious enthusiasm and a deep love of the music and the dance that is fanatic. 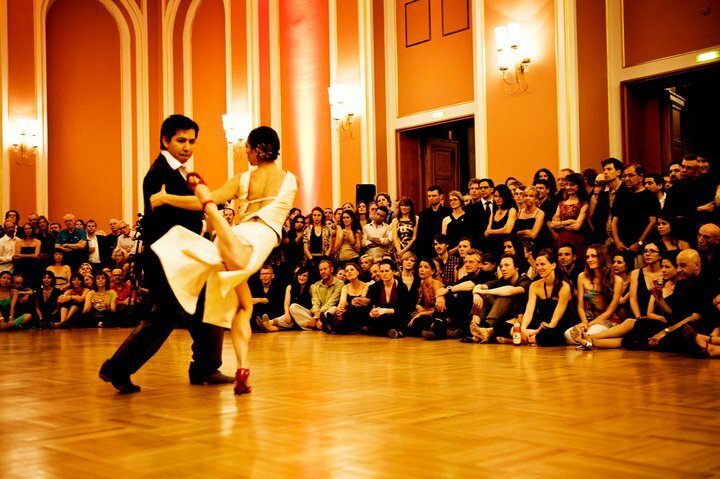 He teaches tango for the social dance floor with an emphasis on connection, musicality and improvisation. He is one of the most knowledgeable and sought after tango DJ's in the US and has been a featured DJ at most tango festivals in the US. Currently, he lives in Washington DC where he is the host, DJ and resident teacher at Milonga Zandunga, one of DC's popular milongas. We are thrilled that this Spring Session this series will be taught by guest resident Marcelo El Chino Gutierrez with Aja Fenn. When: Thursdays, May 15th - June 21st, 7:30pm - 9:00pm. At this point we are able to accommodate two more couples (you must register with a partner). REGISTER HERE. Balance Gym Downtown 1339 Green Ct NW, Washington, DC 20005(third floor). 3pm-5:00pm. Includes a one hour guided practica for participants. Take your musicality to the next level by learning to think like a musician! For men who want to explore the following role. A workshop and practica for women who want to study the leading role. Guided practica for tangueras who want to study the leading role.